We have defeated the bacon flu. It is time to have a New York cut of steak. New York City? yum...and with an Idaho State potato. Makes my pit of a stomach rumble, nothing like a good marbled steak to satisfy a healthy mans appetite, lol. Id do it with some bacon/onion infused green beans, my favorite, but potatoes are a must with steak. Ribasmmokin, Hare you had a Cataholas bacon burito latley? I want to get one today! Zia, Zio, Zia,,Zio, I am hungry too. You guys sound like a techno group. A Year on the Grill, You know we are from the West coast and people from the East Cosst talk funny Word! I'm looking forward to getting my grate like that. 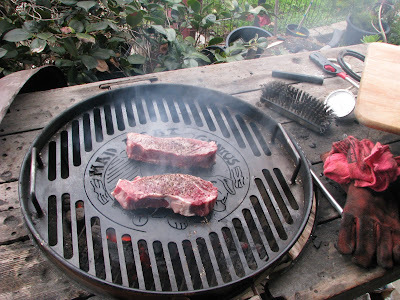 Do you sear the steaks on the open grill part for direct head and then shift them to the "indirect" portion as shown? Just trying to figure out how I'll use mine. Chris, I have been using the whole grill. The steel is so thick that when it gets hot it cooks well all over. When you get your grill I hope to see a picture. I know you will like it. Glad to hear you are back to eating grilled meats - now I know you're going to live. It's nice to see you're keeping your ego grill top scrubbed clean. Photographic evidence!